We had already climbed the North (Contamine) Couloir of the North Face Triangle of Mont Blanc du Tacul (350 m, AD-) -- now it was time to try the Chere couloir (350 m, 70°, D-/D)! Due to the close proximity to the Midi lift the climb is extremely popular and we thus stayed in the Cosmique hut to get an early start and beat the crowds taking the first lift! However, although we were at the base of the climb at 6:30 AM we had a team above us which is not particularly nice in such a narrow couloir! 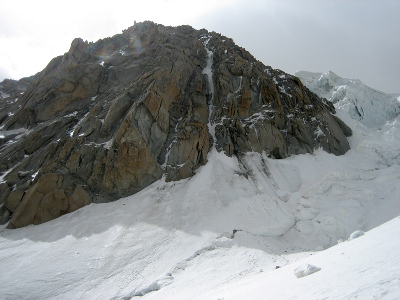 Especially as they reached the mixed climbing above the ice couloir we did get a few small rock falls..... It is thus a climb that I would only recommend if you are first in line! 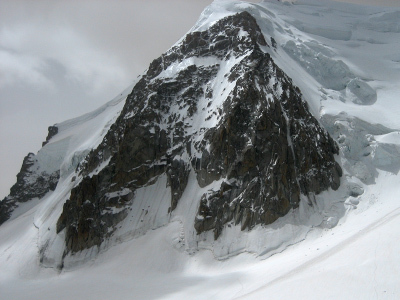 The Chere couloir including the bergschrund and the seracs of the Epaule du Mt. Blanc du Tacul on the right. The seracs of the Epaule du Mt. 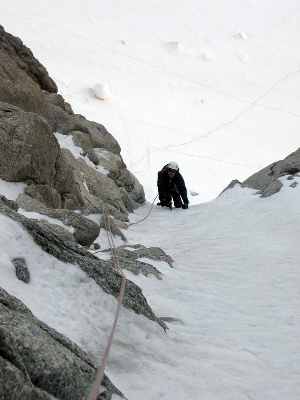 Blanc du Tacul are quite active and it is thus wise to start well to the left on the route and keep an eye on them while belaying the first pitch. Carsten looking back at the author after having negotiated the bergschrund and the initial ice face in order to reach the couloir. 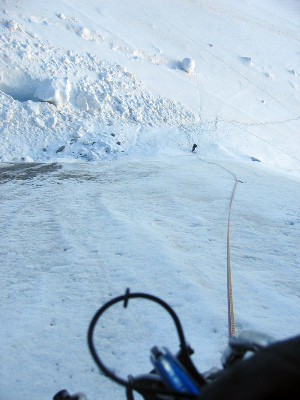 The debris of the seracs remind you to keep and eye on them while belaying the first pitch! 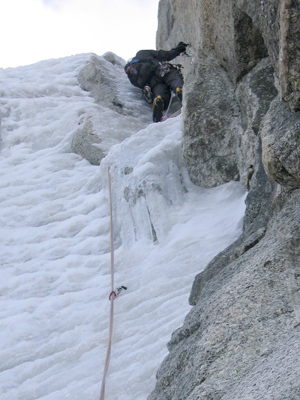 Carsten leads the bergschrund and the initial ice face. It is not too difficult, but as usual it is hard to protect as the ice is not really solid. There are lots of anchors on the route and Carsten chooses one which protects him from falling ice - choose them well as the couloir tends to funnel the ice into the belayer! A typical moment in the couloir. Often it was better to use rock than ice protection as the ice was thin or mixed with snow (and thus weak) in a lot of places. The climbing is quite enjoyable and given that the ice is thin and hollow in some places we sometimes mix climb on the rock and use it for protection. 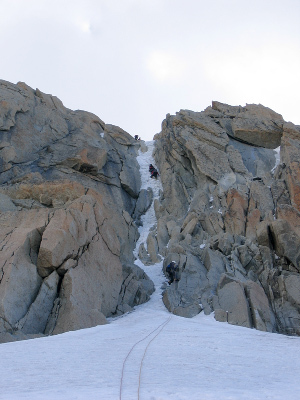 As we reach the end of the ice couloir the inclination drops and the route turns into easy mix climbing on rocks and snow. Hans mix climbing one of the steeper sections. The team above us released quite a few rocks while climbing this section and even more came down as they rappelled it. As we have two teams below us we decide to descent rather than continue up the mixed ground (which looks rather boring) in order not to release further rock fall. It's a bit of a mess being two teams going down while two others are still going up. A nice route, which however is far to crowded in my opinion! Congestion while rappelling the route - we ended up with two rope teams going down while two rope teams were still going up.